Creatabot presents an evening of invention, ideas and science. Many of us have had a crazy concept for a gadget or some type of aid for life. Yes most of them worryingly ended up on Google patents, but maybe you have one that you are not afraid to share. The No Bell prize has only one rule for your inventions…a pretty obvious one. If you want me to spell it out…it mustn’t have any bells! 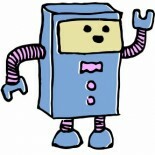 Creatabot will be picking 3 winners for the No Bell prize 2012, who will then be presented with a certificate and a round of applause. Please bring drawings, prototypes and ideas to the evening – which will be held at 161 High Street, Rochester, Kent, ME1 1EH on the 14th September at 7.30pm. Please note, our venue (http://coFWD.org/) is a very old bank building that is being slowly shaped by a community of individuals for long-term Community Interest. Sadly the startup project is in its infancy and being run on limited funds so the building currently has some accessibility issues. If you have specific access or disability requirements and would like to attend an event or activity please let us know at least 5 days before the event date so that we can do our utmost to resolve any potential problems to accommodate. This entry was posted on 12/08/2012 by Natasha Steer in Creative and Art Events and tagged 161 high street, art, art in Kent, art in South East, art news, art news Kent, art zine, artist, bell prize, craft, crafts, creatabot, Creatabot zine, creatarbot, creatbot, createbot, creative, creative Kent, creative magazine, creative South East, creative website, creative webzine, creative zine, creativity in Kent, creatorbot, Gallery, google patents, help creatives, help for artists, indie, indie art, indie magazine, indie zine, Inspiration, invention ideas, Medway, Natasha Steer, news Kent Kent, No Bell Prize, No Bell Prize 2012, online art magazine, online art magazine Kent, online art magazine UK, online creative, online creative magazine, online magazine, promote artists, rochester kent, South East, studio, support artists, support creatives, the arts in the South East, webzine, zine.